I’m guessing that at this point a lot of you have websites, or access to clients sites, and those websites sell some kind of product or service, well what would you say if I could help you increase conversion rate and increase sales and it would only take you a day? Well… I can, and this article will show you exactly how I do it, and how you can recreate it, all the while either increasing your own income or allowing you to charge £500+ per month per client to do so (I generally get between £750-£1000). It takes around 30-40 minutes to set up and will start generating results almost immediately, I generally leave it 24 hours before I check and there are ALWAYS conversions. Now this method works best with sites that already have traffic coming in, but YOU NEED TO HAVE RETARGETING CODES INSTALLED FOR AT LEAST 1 NETWORK ON EVERY SINGLE SITE YOU HAVE ACCESS TO! Here look – this is a screenshot of a new client of mine, the retargeting code was added 32 days ago and the results are already clear to see, in 31 days they have made 132 new sales, with an average profit per sale of £150(ish). The traffic to their site was nearly 10,700 visitors in this time. Averaging a conversion cost of just about £21. They have spent a total of nearly £2,800. Not too bad going is it. This case study will show you how I set up the retargeting on their site, set up a few ads in Facebook and then sat back while their existing traffic, started to buy their product (it’s a car dealership by the way). I’ll give you dump files that you can copy and paste and tell you how to replicate exactly what I have done either for your own site or a clients site. This started off as part of my dream to be super lazy and sit on my arse while my services were sold like products (more about that in a future article), I figured an easy way to make myself a lot of money was to make my clients money in a simple, systemised way, that could be run by my assistants while I got to work on my own projects, like this blog. Now if you’re serious and want to actually increase your (or your clients) conversion rates…. 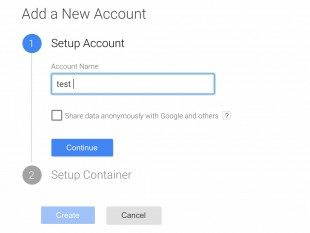 First go to this link and either sign up or sign in if you already have a Google account. 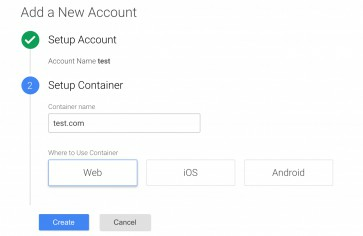 At this point you’re all set up and Google will present you with a nice little code, simply copy it, and then install it on whatever website you want to retarget. If you are using wordpress, you can either install a plugin that lets you insert <head> code, or you can go to Appearance > Editor > header.php and then paste the code before the line that says </head>. If you are not using WordPress then you will need to do whatever you do to make sure that a code fires on every single page. If you are using an HTML site, then you will need to insert the code to every single page. Most CMS sites will have a plugin that lets you install code to the header file, a simple google search should see in the right direction. 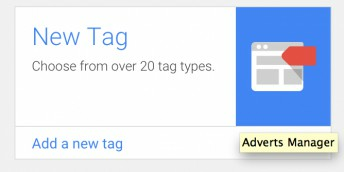 Once you have the code install, Google tag manager will allow you to insert any code into that site at any time, and manage it all from a single dashboard. Later we will come back here and install our custom audience pixel code. But first we need to get that code. Either follow the guides yourself, or send the relevant one to your client, either one will grant yo the necessary access to the required accounts. First go ahead choose “all website visitors” and create that audience, this makes sure that every person who visits your site can be targeted. Next you will need to determine your goals, so ask who you want to target and what pages they have viewed. 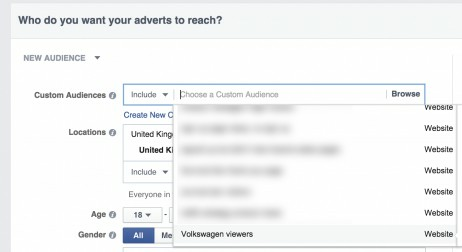 For example, in this example, my client wanted to target people who had viewed individual brands of cars, but had not bought a car, they would then only advertise those specific brands and in some case specific cars to their audience. People who visited Volkwagen pages, would see ads related to Volkwagen. People who had viewed Volkwagen Golf (a very popular car for my client) would see ads related to that specific car. You select the option “People who visit specific web pages but not others”. 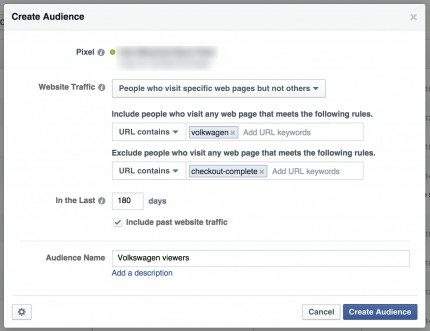 Add any pages that the people you want to target have visited (all of our pages contained the word Volkswagen, so I have simply entered that word). Exclude whatever the checkout page is, this filters out people who actually bought as you don’t need to show them ads. Change the number of days to whatever you want, 180 is the max so I tend to go with that. Name it something and add a description if required. Click create audience and BOOOM, you now have a custom audience set up. It will take a little time for facebook to get your audience info as people need to visit the site to become part of your audience. In the meantime we need to grab the code. Click your new audience and then the pixel ID on the right hand side, then actions then view pixel code, copy it. Now we need to add this code to our tag manager account we set up earlier. I’m not really sure why, but it doesn’t have a standard Facebook tag so we need to select “custom HTML tag”. Paste your code into this space and then click continue. Select fire on “all pages” and create tag. 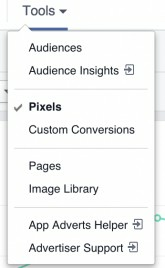 Name it something like “facebook custom audience” and then CLICK PUBLISH, this is very important as a lot of people forget to publish the tag, it will not load if you don’t click it so do not forget. When you see the success notification on screen, you are good to go. From this point your site is tagging everybody who comes in and we will be able to target them at any point we decide to. A different audience for every segment that you want to target. You won’t need to add a tag again, so you can just concentrate on this part now. Create the actual ads – I create 2 simple image ads, 1200×628 pixels, sticking to the 20% text in ads rule (there is obviously a handy template at the bottom). I also create 2 Headlines and 2 text creatives that will appeal to the target audience. SUPER SECRET NINJA NOTE: If you use Facebook Power Editor to create your ads (which I highly recommend), you remove all constraints as to the length of your headline and ad text, which is obviously super handy. Mix them all together for a total of 8 ads. 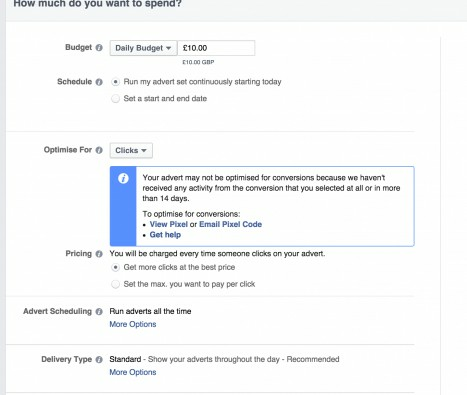 Target ads at custom audience, set daily spend of around £10 (you will never reach this unless you have a massive audience). 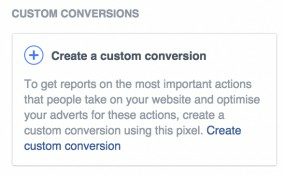 Setup the ads on facebook – Okay so we are now going to setup your ads so that they run to your selected audience. 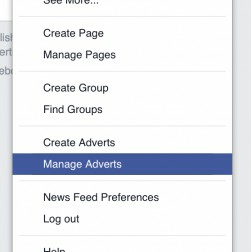 Log back into facebook and access you adverts manager, same as you did earlier. On the next screen input your target URL (the main domain) and then select your conversion that we just set up. You can choose other option if you want to, but I leave the rest blank, as I don’t want to filter further at this point, we can get into that in another article, for now select country or countries and leave the rest blank. This is my spending section, it is almost always exactly the same for every campaign, I set a limit of £10 daily, although it will never reach anywhere close to this, unless you have a huge audience. Go down and insert your copy and headline into the relevant boxes, upload you image and put in the target URL. I like to use a single image in my ads, they tend to convert better for me. Remove the “desktop right column” and “audience network” ads and click place order. Now so long as facebook approve your ad, then we are all done here. Repeat the process for all 8 variations of your ads in the create ads section. Do this for each audience you want to target and change out the ads copy, target URL, headline and images to be specific to each audience. You can then name the conversion and define a value to it. All of this info helps you track and report the effectiveness of your campaigns. You then need to add a tiny bit of your code, but I’ll let facebook explain that as people find it a little more difficult than how I explain it…. Heres the info: Check it after you’ve finished this post! That’s it, on average my clients sites see a 30% increase in conversions with these ads running, facebook doesn’t work for every industry but there are plenty of other retargeting networks such as Google, Instagram, Twitter and I like to use Perfect Audience (I find that Facebook and Perfect Audience is kinda the perfect mix). Previous Post [Small Business Lead Generation Case Study] How to generate £2000 in business in the next 24 hours using simple facebook funnels Next Post Broken Link Building Guide – How to get 250+ Links in a couple of hours work…. OH MY!